Enjoying spectacular views of Port Phillip Bay and magnificent sunsets, in a much sought after area of Mornington for over 50 years, Benetas Corowa Court is uniquely positioned on the Esplanade. Designed for smaller groups of residents with their own shared amenities, this fresh Benetas approach to aged care means residents can make more personal choices and form closer relationships, in surroundings that immediately make them feel at home. Apartment-style accommodation enables each small group of residents to have their own first-class amenities including a relaxing lounge, bright courtyards or lush gardens, an accessible kitchen with pantry, and a family- style dining room. 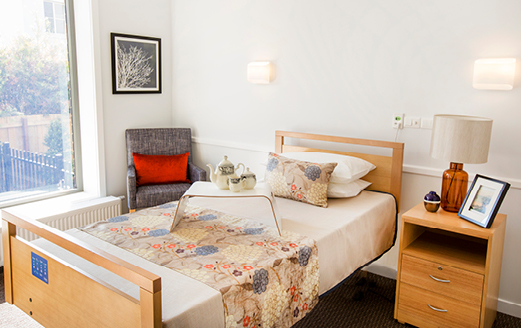 Residents’ rooms are only a short distance from their amenities, doing away with long corridors and the remote accommodation areas of traditional nursing homes. All rooms are brand new, with contemporary furnishings and private ensuite, featuring mosaic tiling and built in cabinetry. Some rooms offer a beautiful garden view; others face the light-filled courtyards with garden features. There are two components to your living arrangements when joining one of our residential homes: your daily care fee, which is the cost of your care (set by government), and your accommodation rate, which is the cost of your room. These are indicative rate estimates only and do not represent a contractual offer. Benetas will not be bound by these rates. Please call on 1300 23 63 82 or contact us for a quote or to discuss your specific needs. Have questions about rooms? Need help with pricing? All rooms are brand new, with contemporary furnishings and light aspect. The private ensuite feature mosaic tiling and built in cabinetry.Some larger rooms overlook a beautiful community park and/or external courtyard, while other rooms are well appointed with bay glimpses and some feature classic wallpaper. What are the meals like at Corowa Court? As smaller groups of residents, there is far more flexibility to make choices about what to eat, and the preferred times that meals are served. Each group has an accessible kitchen, including a pantry, where there are ample provisions so residents can make snacks with each other or with visitors. Nutritious, sumptuous main meals are prepared and served to residents at their leisure. We encourage our staff and volunteers to bring a pastoral sensibility to their roles, to listen to and be truly present to our residents. Our specialist team of non-denominational Pastoral Care Practitioners provide individualised and ongoing spiritual and emotional support. In addition, through our Lifestyle Program, denominational visitors and volunteer companions foster an ongoing connection with our residents’ chosen faith tradition and provide church and chaplaincy services. "They have excellent staff, who are very helpful. I am very happy here. ". Focused on supporting residents and guided by our values of respect, responsibility, community and spirit, Benetas Corowa Court staff are highly qualified and carefully selected based on their experience, qualifications and commitment to putting residents at the centre of everything they do. With the consistency of dedicated support staff teams for each smaller resident group, caring is much more personal and engaging. Primary carers form strong relationships with the residents in their group, built on trust and confidence, allowing a greater ability for self-determination and choice. The familiarity of the same people in the same environment on a daily basis brings a greater degree of normality into residents’ lives. What is the lifestyle like at Corowa Court? Corowa Court has an extensive activities program and features a 14-seat movie theatre. The facility is located less than a five minute drive to Mornington’s main street, and residents regularly enjoy shopping trips and lunch outings. Close links have been established with local community groups, churches and clubs, including the Corowa Court Op Shop who regularly fundraise to benefit residents of the facility.